Before today’s episode of Turning Lemons Into Lemonade, I had never met Laura Pennington. It turns out that she is one of the savviest women building a business that I’ve interviewed on my show. We had SO much in common that it felt like I was talking to myself in a lot of ways. First, Laura talked about how she built her writing business as a freelancer while she still was working in corporate. Then she talked about how despite making more as a part time freelancer than she did in her full time job, she still was afraid to cut the cord and leave the steady bi-weekly paycheck! We talked about the mindset that we often have about our steady paychecks – and despite having demand for our product or service, that it is still hard to think of building a business that is successful enough to support us consistently! 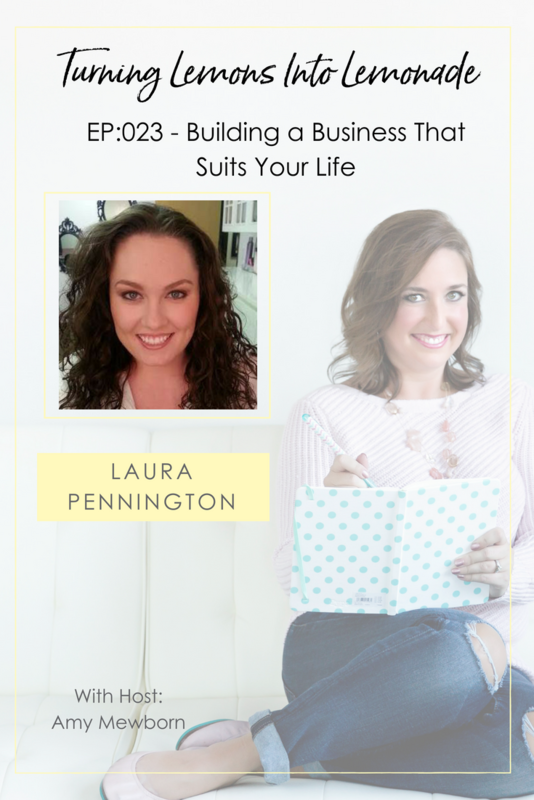 Laura also talked about something I discuss frequently – scaling a successful business that really isn’t in alignment with how she wanted to live her life. You often find that money isn’t everything – and that if business growth and business success is actually costing you in your quality of life, that it probably isn’t the right thing. She talked about how both she and her husband (who is a doctor) made very conscious life choices that led them to better quality of life – and not necessarily more income! As Laura was talking about how she juggles building a business – her freelance business and her coaching business, we talked about productivity hacks to help her manage her busy day. She had some great advice for women business owners – find a mentor who has done what you want to do – not just one who has done something cool! If you get one who has done something cool – they often think you need to do it their way! Find one that is RIGHT for where you are in the business. She also advised that you find the things that are most important and do them at the time of day when you are your best! If you’re a morning person – do them then! If you’re a night person – do your highest impact activities then. Understand who you are and build your business and life around you to generate true success and happiness! To hear the episode – click here!